How many times have you seen The Wizard of Oz? I’m going to guess that I’ve seen it a dozen times. Kimmie, my wife, reckons that she’s seen it at least 20 times. I haven’t the slightest doubt that there are people who have seen it more than 100 times. Unless someone can come up with a more plausible alternative, I have to believe that The Wizard of Oz is the most-watched movie ever made; certainly, according to Wikipedia, it was named by the U.S. Library of Congress as the most viewed movie in syndicated-television history. On this, my (let’s call it) 12th viewing, as movie #4 in Paul’s Creme de la Creme Festival, I felt the magnetic power of this enchanting story. It takes hold early and does not let go. Beneath the charming and delightful fairy-tale elements run deep currents of myth and archetype, which may operate all the more strongly because it does not seem that anyone involved in creating this work, from the original novelist L. Frank Baum onward, had any clear idea of these depths. Indeed, The Wizard of Oz presents a classic example of that strange phenomenon of filmmaking: a crowd of people, working briefly, fitfully, often at cross purposes or in unknowing collaboration. When I had a TV show of my own—one that had no small connection with The Wizard of Oz—I came to see the process less as a collaboration and more as a pack of dogs pulling at a carcass. Something like this was most evident in the writing of Oz. The finished film gives screenplay credits to Noel Langley, Florence Ryerson, and Edgar Allan Woolf, in addition to acknowledging Baum’s 1900 novel. But many more hands were involved—probably too many to track. These included, again according to Wikipedia, Herman J. Mankiewicz, Ogden Nash, Irving Brecher, Herbert Fields, and each of the 4 directors who worked on the movie: Richard Thorpe, George Cukor, Victor Fleming, and King Vidor. And this is just a sampler, for the Wikipedia article names several more, and there will be others who are unnamed. How can such a goulash of creative effort result in one of the best movies ever made? It’s a mystery—another fact to strengthen my belief in the Muse that guides artistic effort from places unseen. To refresh your memory of the story—for surely you know it—Kansas farm girl Dorothy (Judy Garland), an orphan who lives with her Aunt Em, Uncle Henry, three affable farmhands, and her little dog Toto, feels driven to run away from home when a nasty neighbor, Miss Gulch (Margaret Hamilton), arrives with authorization from the local sheriff to seize Toto for allegedly biting her. When she runs down the road with Toto, Dorothy meets a kindly traveling showman named Professor Marvel (Frank Morgan) who uses his crystal ball to persuade her that she will be missed and she should return home. But when she gets back to the farm a tornado is brewing in the sky, and since the other occupants have gone to the storm cellar, she enters an empty house. The wind wrenches a window from its hinges and it conks Dorothy on the head, knocking her out, apparently briefly, and then the house is ripped from its foundation and whirled through the sky to crash down in a strange land that neither Dorothy nor we have ever seen before—the land of Oz. The house has landed right on the wicked Witch of the East, killing her and freeing the diminutive munchkins of Munchkinland from her oppressive rule. Helped by Glinda, the good Witch of the North, Dorothy is sent toward the great wizard who lives in the Emerald City of Oz for help in returning home to Kansas. Along the way she collects friends in the form of the Scarecrow, the Tin Woodman, and the Cowardly Lion, and is followed by the Witch of the East’s vengeful sister, the wicked Witch of the West (who happens to be a dead ringer for Miss Gulch). Magic adventures ensue. Her first encounter with the Wizard is terrifying, and, like a spiritual master, he sets her a daunting task: to fetch the broom of the Witch of the West. When she fulfills the task, the Wizard is tamed and becomes friendly. In the climax, when the Wizard is about to try to carry Dorothy back to Kansas in the air balloon in which he himself arrived in Oz, Toto breaks free, and Dorothy, trying to rescue him (as she first did at the beginning of the story), leaps out. The good witch Glinda appears to advise Dorothy that she has had the power to return home all along: it resides in the ruby slippers that were magically transferred to her feet from the feet of the dead Witch of the East. And with the famous line, “there’s no place like home,” Dorothy awakes to consciousness in her own bed. Having faced her adventure with courage (Cowardly Lion), she now knows (Scarecrow) how much she loves (Tin Woodman) her adoptive family. Her hero’s journey is complete. In Sacred Contracts, Myss introduces her idea of the “8th chakra”—a chakra beyond the traditional 7 of Indian yoga, this one located about an arm’s length above one’s head. Myss suggests that this is the locus of the archetypes that we each embody at different times and in different ways. She provides a list of several dozen of these archetypes, adding that the list is not complete. Her list includes such figures as the Gambler, the Mentor, the Messiah, and she identifies Dorothy with the Orphan Child—one of 6 different manifestations of the important Child archetype. Myss says that “precisely because orphans are not allowed into the family circle, they have to develop independence early in life.” And certainly Dorothy does this. But I’d like to offer another suggestion: that Dorothy embodies another archetype as well, one that does not occur in Myss’s list. I call it the Girl Adventurer, a young female counterpart of the archetypal Hero. Baum based his own story partly on Lewis Carroll’s Alice in Wonderland, and Alice is another example of the Girl Adventurer. Further examples might include Nancy Drew and Belle in Beauty and the Beast. Wikipedia describes Judy Garland’s Dorothy as a damsel in distress, but I don’t see her that way. That is, she is a damsel, and she is in distress, but she does not passively wait for someone to rescue her—she takes action. This is what makes her an adventurer. But the kind of action she takes is different from what her male counterpart might take. For while the male Hero achieves his aims through acts of daring and prowess, fighting or tricking his way past opposing forces, the Girl Adventurer proceeds more softly: she asks questions, makes friends, and, when needs must, reproaches wrongdoers. 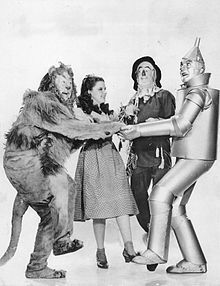 Dorothy, who is always pleasant and caring, is roused to anger when the Cowardly Lion bullies her new friends Scarecrow and Tin Woodman: she stands up to him and shames him. She calls his bluff and it works; he backs down, blubbering. I believe that all stories are about archetypes; that every character has an archetype for a skeleton; and that the better the character, the more strongly he embodies the archetype. In this sense I think that Dorothy is a really good character. Seemingly vulnerable and sweet, she proves to have reserves of courage and determination. Her heart is touched by the plight of each of her new friends, and she is ready to invite them to join her. She is not merely their friend, she is their leader—but she leads by caring. The Hero dares; the Girl Adventurer cares. These are just a few thoughts; there is much, much more that could be said about this story and about this movie. The story is simple, powerful, and imaginative; the production is luscious and striking; the songs are moving and charming. I confirmed my rating of 10 out of 10 for it, and if I were to rate it out of 100, I would probably give it a 98. That’s how good I think it is. And that’s why you and I have seen it so many times. This entry was posted in film reviews and tagged archetypes, Caroline Myss, film reviews, Paul's Creme de la Creme Festival, storytelling, The Wizard of Oz. Bookmark the permalink.